The American Beauty before American Beauty. 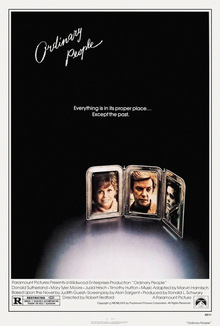 Devastated by the loss of their older son, well-to-do suburban couple Calvin (Donald Sutherland) and Beth (Mary Tyler Moore) are trying to rebuild their lives after their younger son, Conrad (Timothy Hutton), attempts suicide. After reading the novel, I was really ready to see this movie. I heard it one Best Picture at the Oscars against Raging Bull, and I heard it is very close to the novel as well. What I heard was the total truth. This drama is the one of the first films to show a upper-class suburban family in close. This film shows the problems go through shot in a way with such bitterness and sorrow that all of the movie’s real expressions fully come out through the screen. Most of the movie is very similar to the novel which is rare, it features: the same dialogue, characters, and mostly same plot twists. Robert Redford’s directorial debut is surely fantastic and one of the best I’ve ever seen. He fully dissects this film with such a dark and raw emotion that he’s not afraid to show what these characters are inside. The best thing overall for Redford is that he allows this film to breathe, which in all forces the viewer to experience the film on a visceral level. The acting us surely phenomenal as well. The performances are great from all but mostly the one that did it for me was 20 year old debuted Timothy Hutton. When I read the novel how I expected his character to act was how Hutton was he is effective, dramatic, troubled, but most all very sympathetic towards the ones around him and then we soon feel the sympathy for him, which in the end makes his character the one we can most connect to. Also, I was glad to see Mary Tyler Moore sort of step out of her comedian shadow and play a role that asked for so much force and she without a doubt delivered. However, I did have some problems with this. I think they could’ve explored more of Conrad’s life in school such as his relationships with the other guys and his girlfriend, just like in the novel. Also at times I think they shined the light too much on Hutton and furthered away from the true story at hand and it was the parents. The book is a great read but the film is a better watch, and is certainly one of the better film adaptations I have seen in awhile. I just finished watching and reviewing it. This movie is extraordinary. Totally agree with performance and everything you’ve said. I am under the impression and I’d say it totally deserved best picture/director wins that year.